How do I put together Dog Tags? Install the silicone silencer onto each dog tag. Insert the long chain into the hole of one of the dog tags. Connect the last ball of the chain to the connecter by inserting the ball into the cavity and then pulling with both hands on either side of the chain until you hear it snap into place. Insert the short chain into the hole of the other dog tag. Then pass the short chain through the loop of the long chain. Then close the short chain the same way as above. How do I install a silencer on a dog tag? 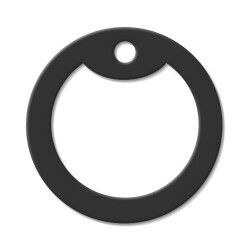 The circular silencers are elastic and are designed to stretch around the rounded-rectangle shape of the dogtag. Be careful not to pull too hard as it may cause the silencer to tear. Learn more about or order extra silencers here. Ensure that the internal groove of the silencer is not stuck together anywhere, if it is carefully separate the edges. Insert the end of the dogtag with the hole into the internal groove of the silencer on the side with the hole. With the holes lined-up, stretch the silencer around the entire dogtag while inserting the edge of the tag into the groove. Manipulate the silencer with your fingers so that it does not cover up any text on the edges. What is the dog tag shaped sticker for? If you received a dogtag shaped decal with your order, you can optionally stick it to the back of your dogtag. 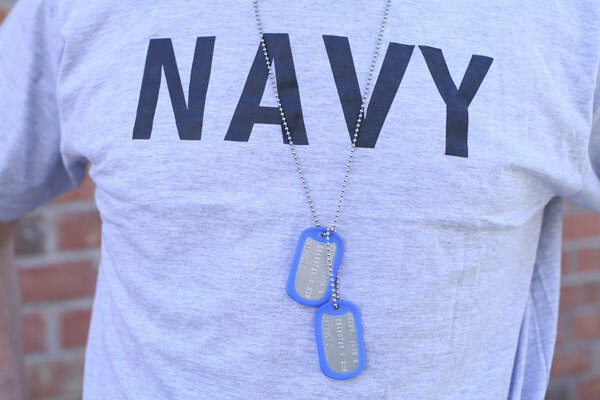 This sticker smoothes out mirror-image reverse side lettering of the embossed characters and to remind you of the high quality of your MyDogtag.com dogtags. Take care when applying it so that the notch in the sticker lines up with the hole, and the edges are parallel with those of the dogtag. Once in place, it cannot be adjusted, and if removed will leave a sticky residue. The sticker is water resistant and will not peel off when exposed to water. How do I wear the Dogtag Paracord Bracelet? The leather-cuff dogtag bracelet comes pre-assembled, however the dogtag will be flat and you will need to manually bend it to conform to the curvature of your wrist. A person with average finger strength should be able to bend and manipulate the dogtag (while attached to the bracelet) until the desired curvature is achieved.